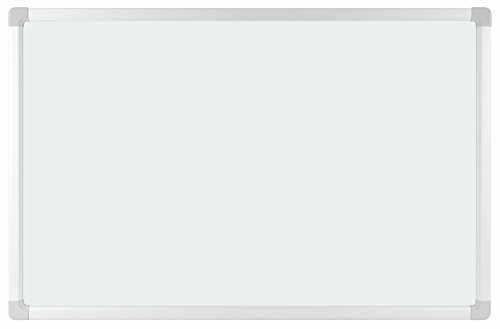 The Moon Aluminum Frame Melamine Whiteboard is ideal for use in your home or workspace to stay organized. You can write on the surface to leave yourself notes, reminders and ideas. The whiteboard has a dry erase surface so you can write or draw on it using whiteboard markers. The melamine surface is smooth making it easy to write on. This board measures 90 W x 60 H cm. There is a aluminum tray included for storing your markers and erasers. Mounting screws are included and once mounted they are covered by the corner caps for a clean look. The flexible mounting system can mount the board to the wall either horizontally or vertically. ✅ Protective, durable, scratch and stain resistant writing surface - a perfect organizer for home, office, university or school use. ✅ Includes easy to mount wall hanger and pen tray. The board can be mounted both portrait or landscape, the wall hanger and pen tray naturally slides onto frame allowing effortless change. ✅ Attachable tray provides a handy space to store dry erase markers, erasers, and other accessories. ✅ Recommend regular cleaning of board surface for best performance. Manufacturer: THE MOON Co., Ltd. Publisher: THE MOON Co., Ltd. Studio: THE MOON Co., Ltd. If you have any questions about this product by themoon, contact us by completing and submitting the form below. If you are looking for a specif part number, please include it with your message. Bright White Large Dry-Eraseable Paper Poster 38 X 58 with 1/2" tinted blue grid- Will Not Ghost or Stain!